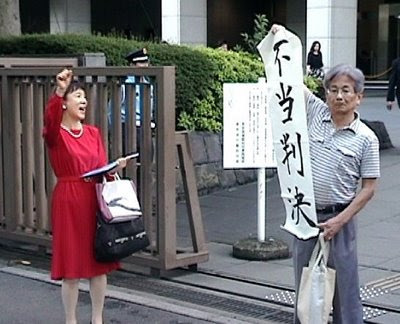 Junior high school teacher Miyako Masuda was dismissed for teaching the truth of "invasion". In an attempt to reverse the dismissal, she took the Board of Education to court. 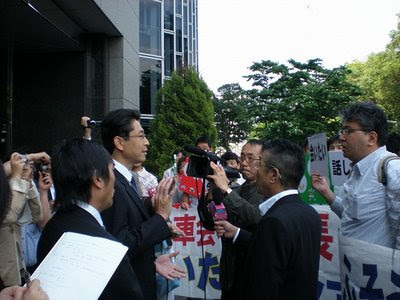 On June 11th, however, the Tokyo District Court Judge Hiroshi Watanabe dismissed the plaintiff’s claims and unfairly ruled against her. The ruling was blindly based on the arguments made by the Metropolitan Board of Education. On this day, some 80 supporters turned out - a number that nearly double the visitor’s gallery capacity. When the unfair ruling was announced, there was an instant outcry from the supporters. 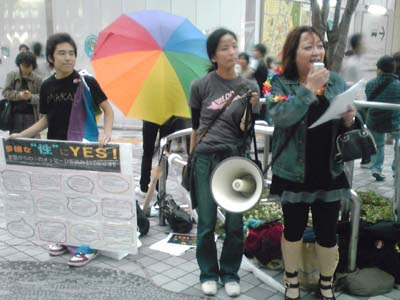 Ms. Masuda resolutely said "I can’t accept this ruling. Despite the Metropolitan Board of Education being unable to prove that I was an incompetent teacher, the courts will not reverse the dismissal. I can only assume that the judge himself is the incompetent. This has made my resolve to continue fighting even stronger". Written by M. Link to video on UnionTube. Photo: Masuda is on left. We Don't Need New Piracy Law! 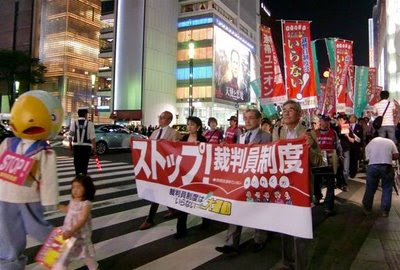 Stop the Permanent SDF Overseas Deployment Law! 200 Demonstrate Outside Diet Building during Lunch Break The government is trying to use the Somalia piracy measure as an excuse to pass a law allowing the government permanent legal authority to dispatch armed SDF overseas. Moreover, they are trying to use this as a way to implement changes to the Constitution by activating the Constitution Review Board. 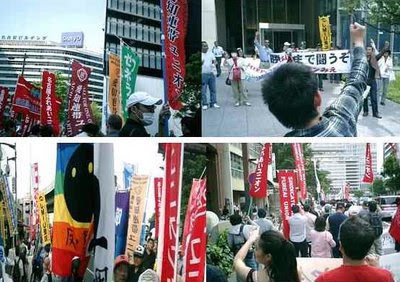 On June 9, some 200 demonstrators gathered outside the Diet to protest against the changes. 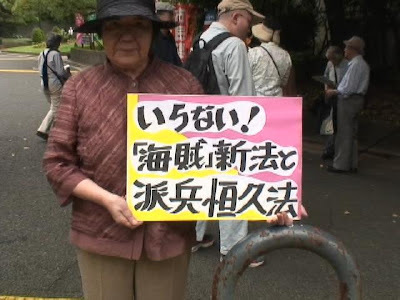 The organiser, Ken Takada, warned participants in the opening speech of impending crisis and railed against the changes: “Prime Minister Aso claims that we need to start a war to defend ourselves against North Korea. We live in times where the PM can openly say something that flies in the face of Article 9. His solution is to solve international conflict through war. 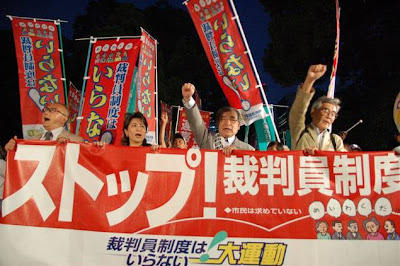 The thought of it makes me sick.” Both the government and opposition parties are aiming to adopt the New Piracy Law after the regular session at the House of Councillors and commence the Constitution Review Board at the regular session of the lower house. This week and next week will be the big turning point of this law, and the 5/3 Constitution Assembly Committee will call out to participants to attend the Committee and to continue participating in actions. Click link for video on UnionTube. 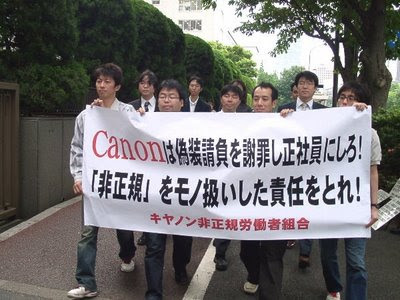 On June 3, five non-regular Canon workers filed a lawsuit against Canon Inc. at the Tokyo District Court in a bid to become recognised as regular employees at the company (see photo). From 2000 onwards, the company has kept changing the employment status of these employees from subcontracts to temporary contracts, and then fixed-term contracts. 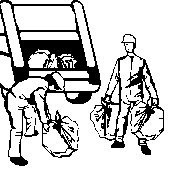 Despite the employees receiving instructions from hiring the dispatching company, they were doing the same kind of work as permanent employees. One of the plaintiffs Mr. Oono thought that ordinarily he should have been made permanent and wondered why his hirer was different from his other workmates. It made him feel contradictory and strange about the situation. Even though his feelings were mixed about his situation - unclear as to whether to feel sad or angry - he decided to continue to fight until his status as a permanent employee is recognised. (Written by Chie Matsumoto) Photo taken by Tsutomu Yoshioka. 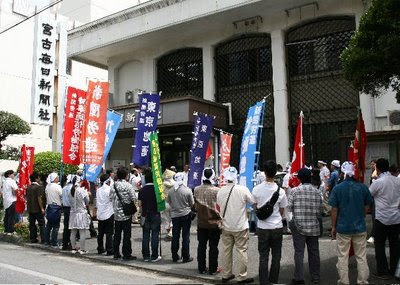 On June 2, some 50 workers, victims of their dispatching and fixed-term contracts early-termination, and their supporters participated in the Let’s Meet the Car Company’s Presidents Tour. The tour started with such energy that participants managed to burst into the front desk of Mitsubishi Fuso’s head office in Kawasaki (see photo). Afterward, the tour went on to visit the five major car companies including Isuzu, Nissan, and Toyota. 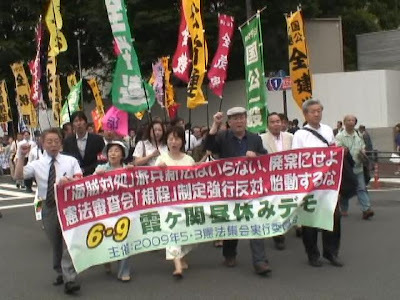 At each company, protesters held companies accountable for unreasonably getting rid of non-regular workers, and demanded that the disputes be resolved. 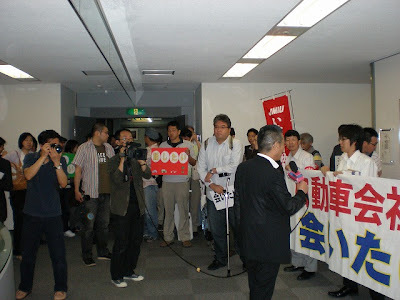 Shuto Seinen Union Secretary General Kawaze received live coverage from Hiro Matsumoto, a former member of satirical comed group called Newspaper. The Secretary General said that “These companies have laid workers off, driven them out of their dorms, and left workers by the wayside with no explanation whatsoever”. 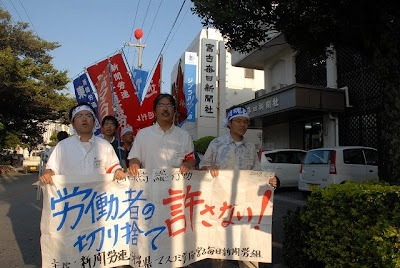 The companies have continued to reject the union’s requests for collective bargaining. Tour participants included JIMU and Hino Motors Union among others. (Written by Chie Matsumoto). (photos taken by Kenichi Kita). 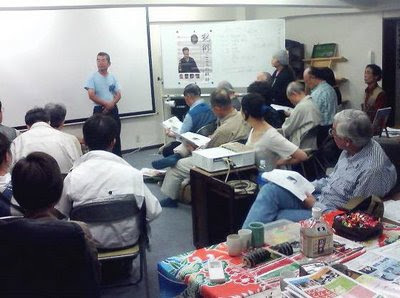 On May 20, the first seminar on Working Poor Senryu was held at Tokyo's MediR. About 30 people gathered to fill the venue with high interests in critiquing and a preview of a movie "Tsuru Akira: Tracing his Thoughts" (Directedby Seijiro Koyama; screening to begin in July). 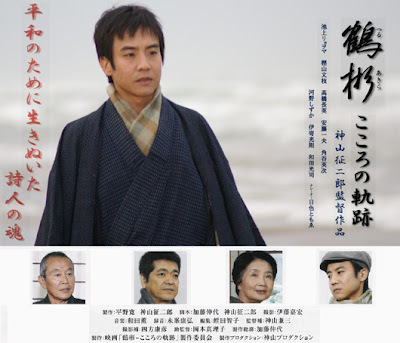 The movie illustrates a life of Tsuru Akira, who led the Proletariat senryu movement during the war. 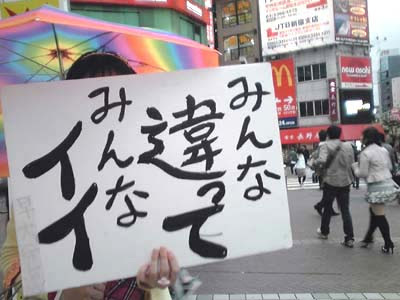 It also introduces a number of senryu poems depicting people suffering from poverty and unemployment and workers' lives during the war of aggression. 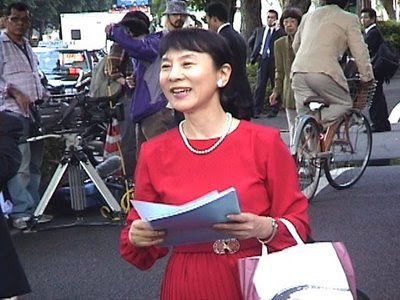 Many participants said that the life of Tsuru Akira during the oppression was impressive and they were touched, and that they wanted more people to watch the movie because the situation is similar to the current recession. Younger audiences said they wanted to see the vulnerable side of Tsuru Akira though they were impressed with his honest lifestyle. (ByM) Photo from critiquing session led by Rankiryu.